Leaving Paris hasn't been easy. I loved the Ville Lumière and I felt at home, even if there's a HUGE crowd everywhere. And when I say everywhere I really mean everywhere. We have walked for miles and miles for five days and today I'm very tired. But Paris is well worth a foot ache! To cut long and crying story short, today I've made a very simple nail art. I must admit this is a shortcut, because I do not like half moon. I think half moon suits better over an oval shape. Mine is squared, or squoval at least, so I do not like the final effect. Partire da Parigi non è stato affatto facile. Mi sono sentita come a casa nella Ville Lumière, nonostante la moltitudine (inferocita) dei turisti. Erano dappertutto. E quando dico dappertutto, intendo proprio dappertutto. Abbiamo macinato chilometri per cinque giorni e sono a pezzi, ma Parigi val bene qualche callo! 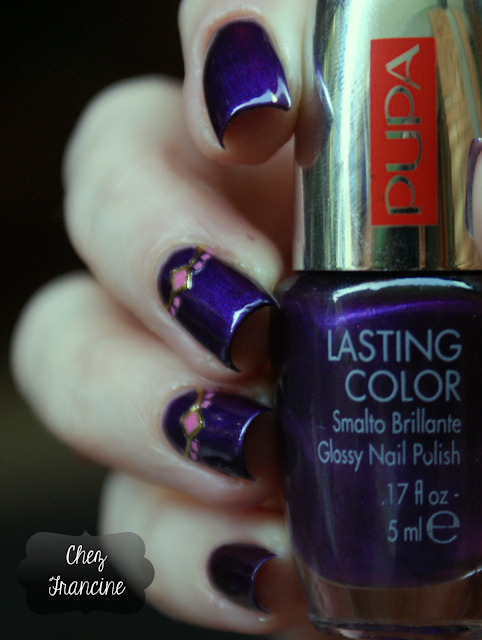 I've used two coat of Pupa 416 Pearly Dark Purple, a blue-based purple whit a lighter shimmer. On middle and ring I've used a couple of Tiger nail stickers. I purchased a pair of them on early days of September and even if they are conceived for french smile line, they fit nice for half moon. Like a golden necklace. 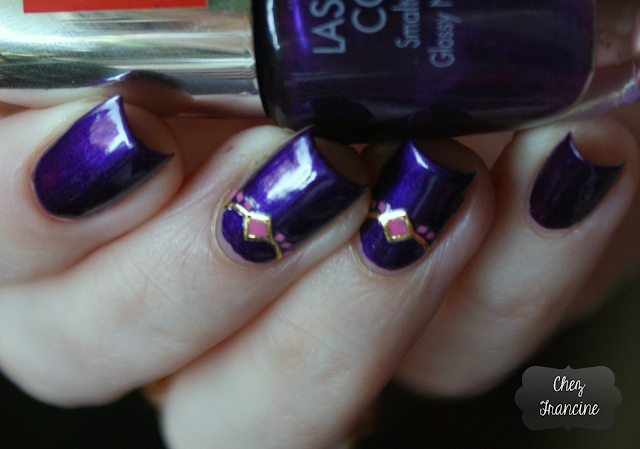 I've cutted the stickers around the cuticles and I've used the top coat to finish my nail art. 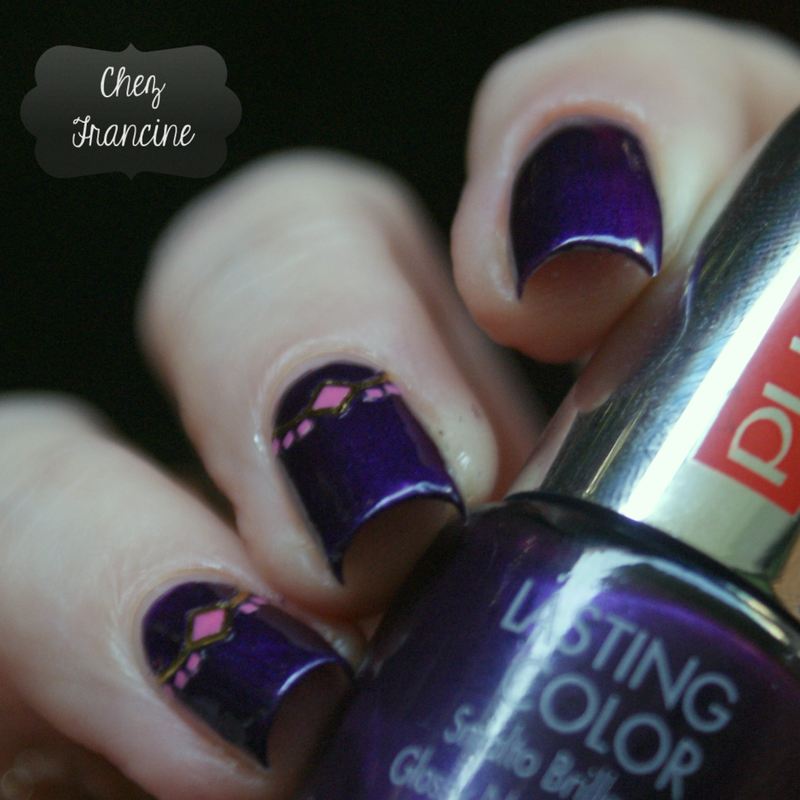 Ho usato due mani di Pupa 416 Pearly Dark Purple, un viola con una forte componente blu ed uno shimmer più chiaro. Sul medio e l'anulare ho piazzato due stickers di Tiger che ho comprato all'inizio del mese. Sospetto che siano concepiti per arricchire le french manicure, ma svolgono egregiamente il loro compito, come un collier d'oro. Ho tagliato l'eccesso con un paio di forbicine e ho steso il top coat. Et voilà ! I like the purple+pink+gold alliance. I'm not sure this design should be a necklace. It could be a belt too! What do you think about it? Thank you for stopping by and have a nice Friday! Il risultato finale mi piace molto, ma non sono sicura che si tratti di una collana. Potrebbe anche essere una cintura. Voi che ne dite?